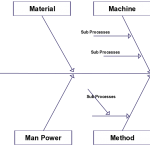 Fishbone diagrams can be defined as a diagram that shows the possible causes of a specific event or a problem. They were first introduced by Kaoru Ishikawa in 1968 which is why they are sometimes referred to as Ishikawa diagrams. He pioneered the quality management processes at Kawasaki and used Ishikawa diagrams as part of the process. Whether it’s manufacturing or any other niche, the first step is to to clearly define the outcome or the effect of the analysis. Once you agree on the effect add it to the head of the diagram. Now it’s time to add the bones. And they become the bones of your diagram as shown below. The 6 Ms are the globally recognize standard, but some expand it even further to add management and maintenance to the mix. So, if it applies to your organization, you can expand the diagram and make it 8 Ms. Also if necessary, add more suitable names to the diagrams so they make more sense to others. Once you have the basic structure, you can collaborate on the diagram as a group and identify the various causes that affect the final outcome. With a fishbone diagram, you will be able to have a visually appealing set of ideas organized by category rather than a random and sometimes even irrelevant set of ideas. 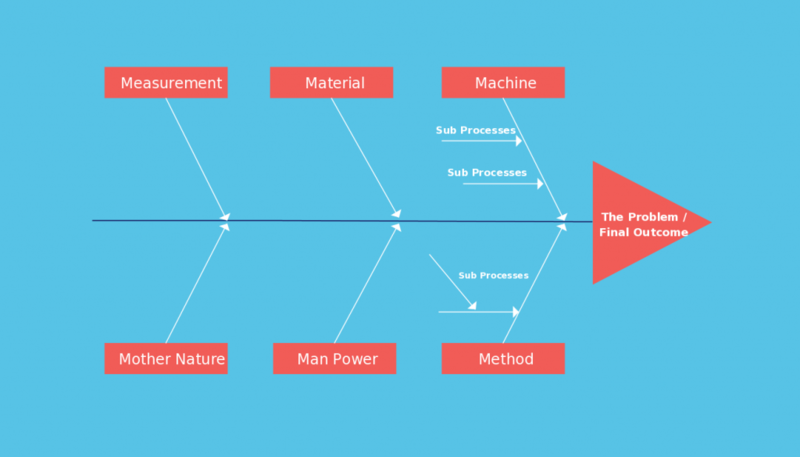 Check out this article to learn more about the process and how you can more effectively use fishbone diagrams for manufacturing. Marketing is another area that can hugely benefit from a systematic fish bone diagram. It is usually an area that is somewhat harder to measure and where people have many opinions. It is important to capture those opinions and see how they impact the final outcome. And cause and effect diagrams are probably the best way to represent those ideas visually. And they become the bones of your diagram similar to the one shown below. 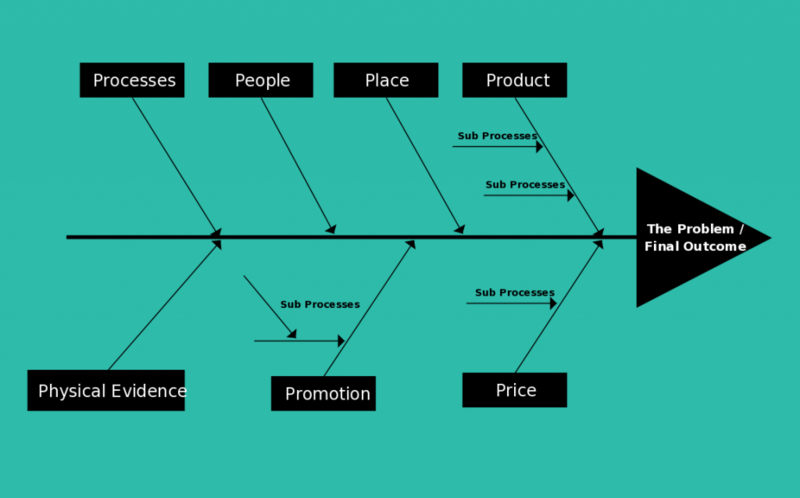 All the branches shown in the diagram might not affect your marketing processes. So feel free to remove/modify branches as necessary. The key is to identify an expected outcome for problem and analyze the causes for that problem. And in marketing there are usually many problems. Below diagram show an Ishikawa diagram template with 5 S’s already added to the bones. Although individuals can use fishbone diagrams, they are much more effective when used by a team. After all, they are used to identify causes for a specific effect, so more people getting involved mean a lot more ideas. If everyone’s in one location, then drawing a fishbone diagram in a white board and asking people to contribute ideas is a good start. This is very effective because then you can ask questions from each other or from the relevant authority and dig deep into the problem. A drawback could be that people are reluctant to come up with ideas in front of a crowd. Also there is no record for you to analyze and improve later. With a software like Creately, not only can you create fishbone diagrams, multiple people can collaborate on that diagram in real-time. This means you can see the changes made by each other immediately and can raise concerns then and there. All the revision are preserved so you can clearly see who made the changes and what are the changes made. Plus you have the added benefit of ability to draw many other diagram types. All the diagrams shown above are available as templates in Creately. Just click on any of then and you can immediately start modifying them online. 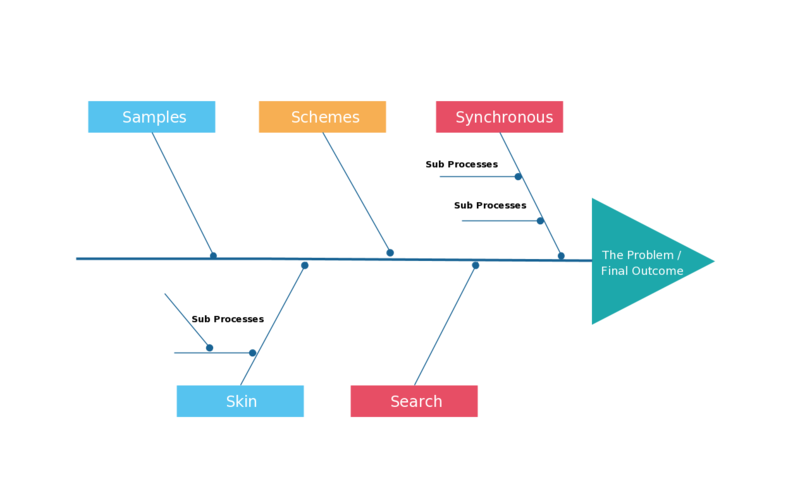 But if you prefer more colorful ones or ones with some images then there are plenty more fishbone diagram examples in our diagramming community. Got any question about this fishbone diagram tutorial? Need assistance with drawing them? Do let us know in the comments and we’ll try to answer them to the best of our ability. Kindly inform how fish bone diagram shall be effective in finance industry keeping in aspect the customer satisfaction and service offered. Kindly write me about “Zero- 1” ranking method for fishbone diagram . What is it and how to work? Very Informative diagrams, Thanks a lot for sharing.